I agree with what he said. He’s right. Fans running onto the field causing a delay is stupid. They could be dangerous and we have seen it before. The anger and frustration is justifiable. 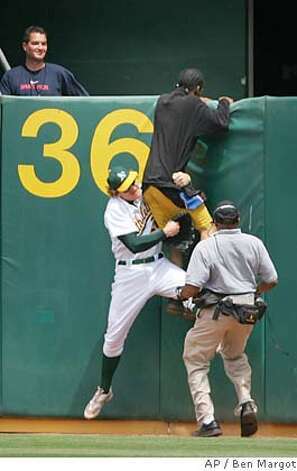 Of course, there is a fine line as to what fans can and can’t do when running onto the field. Even yesterday I was talking about how cool it was when those two fans ran onto the field to congratulate Hank Aaron. I love it when fans storm the field or court after a huge upset win in sports. But the incident that Jones was referring to was two idiots who did nothing but cause a delay. They weren’t celebrating, but they were just doing something stupid. We’ve seen in the past that sometimes these fans have attacked the athletes. It’s scary. I’d imagine if I was a player I would punch or tackle a fan running onto the field. In fact, I even saw that happen live once. Player safety is important. Fans pay to watch the game in the stands, not run onto the field. If someone does do that, they should be fined a lot of money. Maybe $25,000 and a lifetime ban would be fair. Also jail time. I never understood the desire to go interrupt a game. I have laughed at it, sure. But there are times where I am just frustrated and players don’t know what these fans are up to. Do they have knives or guns? What is their agenda? These things shouldn’t happen and if Jones feels like he needs to dropkick somebody with his cleats on to protect himself, I am for it. Also, don’t throw bananas at him. Adam Jones doesn’t like it when fans interfere with his job. This entry was posted in Baltimore Orioles, MLB and tagged Adam Jones, Fan Behavior. Bookmark the permalink.